South India: RK Nagar (Chennai) verdict against both AIADMK and DMK, an independent Dinakaran wins! Considering the by-poll outcome of RK Nagar in Chennai It seems Tamil Nadu politics is making a pointed departure from the usual path for several decades so far pursued by the Tamil Nadu state to give DMK or AIADMK mandate to rule, by rrejecting bothand electing an independent candidate Dinakaran – a close relative of jailed Sasikala. In RK Nagar bypoll, TTV Dhinakaran defeated AIADMK’s Madhusudhanan and DMK’s Marudhu Ganesh. Voters seem to have reacted to BJP government’s interference in the state. In what seems like a setback for the opposition DMK and their leader MK Stalin, VK Sasikala’s nephew TTV Dhinakaran has taken a huge lead as votes are being counted today for the by-election in Chennai’s RK Nagar, the key constituency that fell vacant after the death of former Tamil Nadu Chief Minister J Jayalalithaa in December last year. None of the candidates other than independent TTV Dinkaran has won any round of countering. After 15 rounds of counting, Dinakaran is ahead with 81,317, followed by AIADMK’s Madhusudhanan who has 44,522 votes and DMK’s Maruthu Ganesh, who has 22,962 votes. Dinakaran polled 89013 votes and got 50.32% of the total votes polled, won the by 40707 votes. Ruling party candidate Madhusudanan got 48306 votes less than half mark. DMK has been shunted to third position with 24581 votes and lost the deposit. BJP which also said would win the constituency has been pushed to a pathetically distant fourth position with just 1714 votes. NOTA have a respectable 2373 votes. The constituency was earlier represented by former CM late J. Jayalalithaa who passed away in December last year. Around 77.68 per cent voters exercised their franchise in the battle for this prestigious assembly seat in Tamil Nadu. TTV Dhinakaran continued to lead right from the beginning of counting the first round. “The people of RK Nagar have given me a big victory. I am an independent candidate just for name sake, all party (AIADMK) workers are with me. I also have Amma (Jayalalithaa)’s wishes,” says TTV Dinakaran. In a bitterly fought election which can have huge political implications in Tamil Nadu, sidelined AIADMK leader and independent candidate TTV Dhinakaran on Sunday secured a comfortable win in the RK Nagar bypoll. Dhinakaran polled 89,013 votes out of total 1,76,885 votes while his nearest rival, official AIADMK candidate E Madhusudhanan, secured 48,306 votes. All other 57 candidates, including DMK’s Maruthu Ganesh, 24,651 votes, and BJP’s Karu Nagarajan, 1417 votes, lost deposits. Dinakaran won the constituency by a majority passing even the lead record of former CM Jayalithaa. All candidates including BJP other than ruling ADADMK’s lost their deposit. Interestingly BJP fell behind the NOTA. DMK which look forward to win the seat to claim it as a mandate for ruling the state came third with a poor showing. 54-year-old Dhinakaran, who contested as an Independent candidate, was always leading by a big margin followed by the ruling AIADMK’s E Madhusudhnan; DMK candidate common man Marudhu Ganesh at number 3. With Ganesh, as its candidate, the DMK had hoped to send a message to the party cadre that ordinary workers too could rise to important positions in the party. Ganesh comes from a family of DMK card holders; his mother was a municipal councilor between 1996 and 2001 when DMK working president Stalin was the mayor. By defeating the ruling AIADMK, Dinakaran has shown that name of the party and symbol do not matter at all. And only the candidate is important. The DMK tried to make it a triangular contest, fielding N Maruthu Ganesh. The bypoll was first scheduled to be held in April this year, but was cancelled due to complaints of large-scale voter bribery. This round of voting was also not devoid of controversy. A Dinakaran loyalist released a video on the eve of the by-election purportedly showing Jayalalithaa in a hospital few days before her death. Ganesh’s chances of winning were the brightest during the cancelled round of by-polls in April when the DMK had hoped the AIADMK votes would split between the two factions led by Chief Minister E Palaniswami and O Panneerselvam; the two sides merged in August this year. But the election was cancelled by the Election Commission after videos showing cash being paid to voters had emerged. The RK Nagar battle symbolizes the larger fight for the legacy of Jayalalithaa between her long-time friend VK Sasikala and her party the AIADMK. Mr Dhinakaran, who was the number 2 of AIADMK, was sidelined by the party after his aunt VK Sasikala got jailed in a corruption case, but both Ms Sasikala and Mr Dhinakaran claim to the legacy of Ms Jayalalithaa owing to Ms Sasikala’s long association with “Amma”. DMK did not criticize Dinakaran but only targeted the ruling AIADMK because DMK wanted to finish off AIADMK and come to power as early as possible. It is eager to see the ruling party is under pressure and lost it majority. The ruling AIADMK is worst hit party as its prestige and future said to be depended on the winning of the seat. The bypoll held on December 21 had seen a record 77.68% voter turnout. RK Nagar, represented twice by Jayalalithaa, has an electorate of 2, 28,234, comprising 1, 10,903 men, 1, 17,232 women and 99 transgenders. Bharatiya Janata Party (BJP) MP Subramanian Swamy on Sunday questioned his party’s accountability after it scored lesser votes than None of the Above (NOTA) in RK Nagar by-polls. Criticising the state BJP leadership for a poor show, Swamy tweeted, “TN BJP record: A national ruling party gets a quarter of NOTA’s vote. Time for accountability”. Dinakaran is not known leader but promoted by TV channels as he faced corruption charges and was sent to jail. He and Sasikala la are known corrupt leaders. Dinakaran, who has won the RK Nagar constituency earlier represented by Jayalalithaa, knows well all weaknesses of Indian politics and poll system and has misused them to win. He knows money makes wonders for the greedy people. Dinakaran who says the bypoll is a referendum the performance of EPS-OPS duo in the state, has declared himself as the “true political heir” of the late J Jayalalithaa after being assured victory the by-election to RK Nagar assembly seat in Tamil Nadu. Thanking voters, the sidelined AIADMK leader has vowed to bring down the EPS-OPS government in the state “within three months”. It appears Dinakaran and Sasikala have planned and executed the RK Nagar by poll by many strategies. They created the impression that Dinakaran and she are the victims of conspiracy by BJP. They have spent huge money through foolproof strategy. 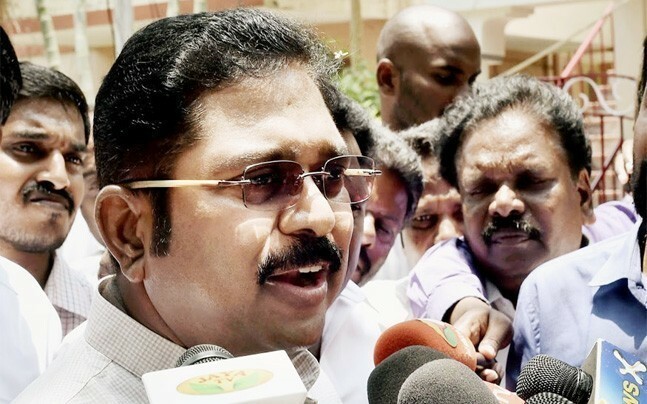 Dinakaran his supporters maintained close touch with voters in the bypoll campaign earlier and after the poll was postponed they continued their work to influence the voters with money with a common religious promise that they would not cheat Dinakaran and Sasikala after taking the money. Many say people have only kept their word. The vote, if genuine, against the AIADMK and for Dinakaran the person who harmed the government enough damages shows their real anger for the government and party. AIADMK has a few leaders who want to have truck with BJP, giving it a lot seats to help make a comeback but people have rejected both AIADMK and BJP in RK Nagar. But the leaders need to know that people in Tamil Nadu do not support the Hindutva hate agenda of BJP. Stalin has alleged that Rs. 100 crore were given to voters by the ruling AIADMK ahead of the by-election, adding that the ruling AIADMK has given Rs. 6,000 to each voter, and the operation, he insisted, had the support of the police. PMK leader Anbumani Ramadas has said Dinakaran has won RKN but people lost the election. When the CM E. Palanisamy refused to visit the areas affected by the recent natural calamity that claimed hundreds of life it revealed to public that the government has ignored the suffering of the common people, especially in fishermen community which goes against the philosophy of politician as a public servant working only for the people. The government’s decision to float more liquor shops went against the promise of Jayalalithaa to the people. .
By rejecting the ruling AIADMK, voters of RKN constituency seems have expressed anger and disappointment with the Jayalalithaa’s party. Possibly, unlike the party members and active supporters, common people are unhappy about her illicit relations with a film star and giving birth to a female child and keeping the matter very secretly till her death. The by-election became a prestige battle between the two factions of AIADMK on the one hand Edapadi Palaniswami – his deputy CM O Panneerselvam and TTV Dinakaran. Dhinakaran, M Ganesh of DMK and E Madhusudhanan of AIADMK are main candidates in the fray for the bypoll. The bypoll campaign was marred with reports of distribution of cash for votes by different groups. Now it is clear that the bypoll was primarily a contest between Dinakaran and the merged faction of chief minister E Palaniswami and deputy CM O Panneerselvam, with the result deciding the battle for Jayalalithaa’s legacy. While Dinakaran contested as an Independent candidate, the EPS-OPS faction had fielded Madhusudhanan. People could not digest the way the TN government is being controlled by Federal government of BJP. So, if AIADMK wins, that would amount to victory for the BJP even though BJP faired extremely bad. One important outcomes of the RK Nagar poll is that people have voted against the communal parties and Hindutva agenda. In fact the RK poll outcome has not made any promise that Dinakaran c would be made CM by people and there won’t be any change in politics. Had AIADMK or DMK won the position would be the same as the win won’t be a clear cut certificate for future victories. .
Next general poll in the state is entirely different issue. Dinakaran hopes for getting more MLAs and even MPs from the ruling Party and has said the AIADMK government would be removed in three months. In politics anything can happen. Both MGR and Jayalalithaa catered for the women constituencies and the RK poll results show, if they are indeed genuine, that the current ruling AIADMK party has caused erosion of the women votes that may have w gone to smart looking Dinakaran. Getting back the party symbol Two Leaves has not saved the party though it could come second head of DMK. The big show of the NOTA (against support for any candidate) getting more votes than the BJP reveals that Tamils are annoyed about the political drama in the state. DMK could not make any profit out of death 0f murder of Jayalalithaa. Ruling AIADMk is the prime target of DMK as it is eager win the next general poll to make Karunanidhi take power at the Madras Fort and on Marina Beach if he dies while in office. It is alleged DMK has transferred parts of its vote bank in favor of Dinakaran so that the AIADMk loses. AIADMK lost but is it because of transfer of DMK votes? Jayalalithaa worked against the 2 G spectrum scam but Dinakaran welcomed the court d verdict in favor of DMK and O Panneerselvam sees the hidden nexus between DMK and Dinakaran and vote transfer could be a fact. AIADMK must cater to the women constituency by a few steps. One would be to invite the daughter and niece of Jayalalithaa to join the party and lead the women wings to further strengthen the party and save the government until the next general poll and after that. As long as Jayalalithaa was alive, women vote-banks were ensured by her own presence even without meeting them during her illness but also after her death the party has no proper popular women face. OPS and EPS could replace Jayalalithaa’s image. AIADMK met at the party HQ on December 25 in Chennai to discuss the poll debacle and removed 6 party district level chiefs, who support Dinakaran and Sasikala, from the party and replaced them with new office bears. There were not removed till now may be because EPS-OPS thought they would bring Dinakaran back to the party. Now that hope has vanished and hence the party axe on them. .
All said and done, now the government has got the opportunity and time to serve the people directly, cut further the liquor shops and stop liquorization of the society in favor of women, and cut corruption in offices, including in police stations where money si making services as business. Make the offices accountable for corrupt practices by punitive measures and instruct the party cadres not to take bribes and worked for party and government sincerely.